Summer is coming to a close here at Northern Homestead. August was a rainy gardening month – we got all the rain we were short of in spring. Things are growing and ripening so nicely though. 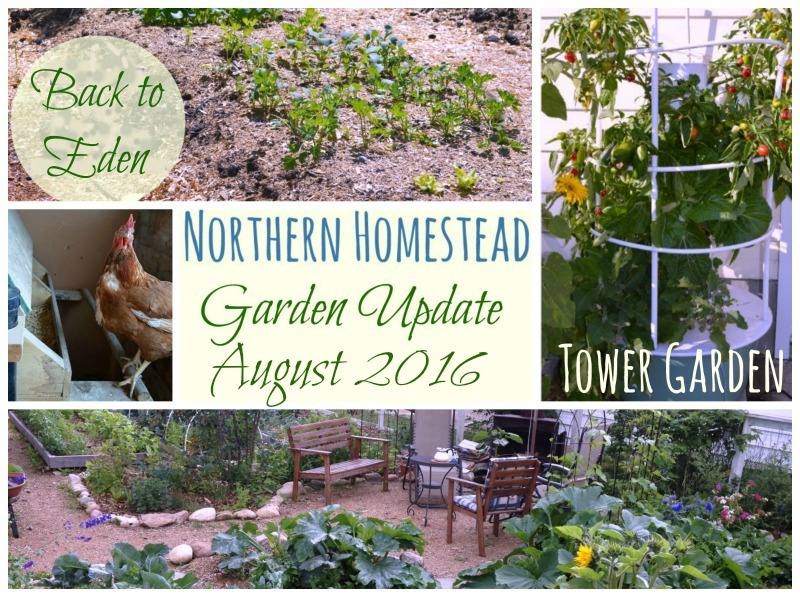 In this update we take a look at the roofless greenhouse and the tomatoes growing in there, the peppers and eggplants on the tower gardens, squash and radishes happily growing together, and the heirloom tomatoes in the garage greenhouse, as well as other plants growing in our organic garden. This might just be the last garden tour this summer. I hope you enjoyed the tour, as you can see lots is growing well! Your garden is just lovely! I live a little north-east of Grande Prairie, and thank you for your inspiration ???? Thank you! We Albertan gardeners need all the inspiration we can get sometimes ;). This was a good year for us. Even though we had more rain than usual, the night temperature did not drop as low as most summers. It helped a lot for plants to grow. Happy gardening! What a beautiful and abundant garden you have! We gave Back to Eden gardening a shot this year and I am sad our garden didn’t grow that great. I am sure there are a lot of factors to consider but I am hoping for a better growing season next year. Usually we grow zucchini and squash like crazy but this year they never took off. What do you recommend for putting your garden to bed for the winter? Do you weed it out, add more manure and chips? we are also adding a high tunnel to our farm. We were hoping to put it over a spot we had prepped for BAck to Eden, but I am thinking that method might not work for greenhouses? Sorry for so many questions, but we need help! Thank you Erika for your kind words. We are very grateful for our garden bounties the Creator God is blessing us with. Sorry to hear your garden did not do well. As you say there can be many factors. The most common problems are wrong wood chips and not enough of them (See challenges with Back to Eden). We do put our garden to bed for winter, here is how. We use Back to Eden in grow bags in our roofless greenhouse and it works great. I don’t see why it would not work in an enclosed greenhouse. OK, I got lots for you to read, just do not give up. And please ask if you have more questions, we are happy to help if we can. Thanks, Anna, for the encouragement. I was feeling really downcast yesterday about our gardens and you came into mind to email.